The Winston-Salem Metropolitan Statistical Area, commonly known as part of the Piedmont Triad, is located in the North-Central portion of North Carolina. The city itself is the second largest municipality in the Piedmont Triad region and the fourth largest city in the state. Winston-Salem is called the "Twin City" for its dual heritage and "City of the Arts and Innovation" for its dedication to fine arts and theater and technological research. Although the economy of the Winston-Salem metro area and that of the surrounding Piedmont Triad has traditionally been centered around the textile, tobacco, and furniture industries, many of the old industries in the area began to die out. In response, Winston-Salem is transforming itself to be a leader in the nanotech, high-tech and bio-tech fields. Medical research is a fast-growing local industry. A portion of downtown Winston-Salem has been designated as the Piedmont Triad Research Park, a highly interactive, master-planned innovation community developed to support biomedical and information technology research and development. Many locals refer to the city as "Winston" in informal speech. "The Dash" is referenced from the hyphen between Winston and Salem and was popularized by the nickname of the local minor league baseball team, the Winston-Salem Dash. The Triad occupies a prominent place in the history of the American Civil Rights Movement. The area is served by Piedmont Triad International Airport. Salem Square and "God's Acre", the Moravian Graveyard, since 1772 are the site each Easter morning of the world-famous Moravian sunrise service, which attracts thousands of worshipers each year. A popular destination for those relocating from the Americas, South Asia, Southeast Asia, and East Asia. Winston-Salem maintains a "sister city" relationship with five cities around the world (Ungheni, Moldova; Kumasi, Ghana; Nassau, Bahamas; Shanghai, China; Buchanan, Liberia) in order to foster international friendship and cooperation. Politics and education attract a wide variety of people to the Winston-Salem Metro area from across the country and around the world. With this new growth in population and diversity comes new challenges for existing churches. 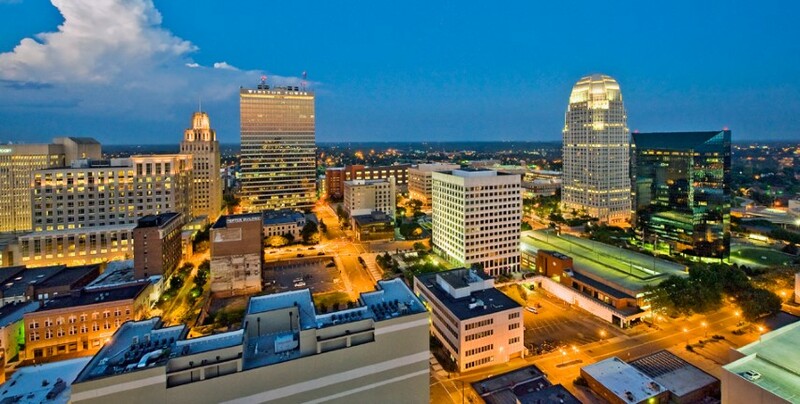 Winston-Salem is geographically located between the largest North Carolinian cities of Charlotte and Raleigh-Durham. This makes it one of the most strategic places in the state for ministry and church planting among some of the most transient and diverse communities. Many existing churches need revitalization and many new churches need to be planted. All churches need to make disciples who obey the Great Commandment, fulfill the Great Commission, and demonstrate a loving knowledge of the changing context around them. International Friendship Family Program - A program designed to connect Wake Forest University international students with local families in the Winston-Salem area. The ultimate goal of the Friendship Family Program is to facilitate the development of lasting and rewarding relationships by matching freshman & sophomore students with families based on interests and hobbies. The families are meant to serve as a support system to students during their time spent in the United States. International Village - Winston-Salem's downtown international cultural festival. The Hispanic League - A non-profit which serves as a liaison between the Hispanic and non-Hispanic community, and strives to improve the quality of life for Hispanics/Latinos through promoting community inclusion, education, health and multi-cultural understanding. Indo-US Cultural Association - A non-profit organization whose primary mission is to increase awareness of the cultural heritage of India in the Triad of North Carolina.